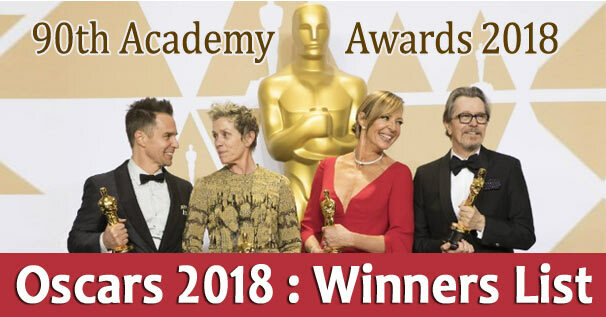 The 90th Annual Academy Awards honoured the most remarkable contributions to the world of cinema in the Dolby Theatre in Los Angeles on 5 March, 2018. The biggest night of Hollywood, the 90th Academy Awards celebrated the biggest and best names in the movie business. Frances McDormand, "Three Billboards Outside Ebbing, Missouri"
"Remember Me" by Kristen Anderson-Lopez and Robert Lopez from "Coco"
Roger Deakins, "Blade Runner 2049"
James Ivory, "Call Me By Your Name"
John Nelson, Gerd Nefzer, Paul Lambert and Richard R. Hoover, "Blade Runner 2049"
Paul Denham Austerberry, Shane Vieau, Jeffrey Melvin, "The Shape of Water"
Richard King and Alex Gibson, "Dunkirk"
Mark Weingarten, Gregg Landaker, Gary Rizzo, "Dunkirk"
Kazuhiro Tsuji, Lucy Sibbick and David Malinowski, "Darkest Hour"